The world's longest cable car line, a 5.7-kilometre engineering feat that spans a spectacular gorge to Armenia's ancient Tatev monastery. Armenia on Saturday launched the world's longest cable car line, a 5.7-kilometre engineering feat that spans a spectacular gorge to the country's ancient Tatev monastery. 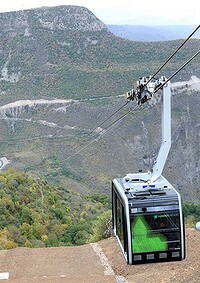 Gathered in Armenia's southern mountains near the border with Iran, guests including President Serzh Sarkisian and the head of the Armenian Apostolic Church, Karekin II, took part as the cable car link launched its first official voyage over the Vorotan River Gorge. The link will allow year-round access to Armenia's ninth-century Tatev monastery complex, one of the country's most important religious centres and a major tourist attraction. At the opening ceremony, Sarkisian said the link was of "exceptional importance for Tatev and the surrounding region" and praised the project for overcoming the many difficulties involved in construction. "This cable car line shows that even dreams that seem unrealistic can be realised with faith and purpose," he said. Karekin II said the launch of the link was an important step in restoring access to "a centuries-old holy shrine which was a place of pilgrimage from apostolic times." "Through its beauty and stunning construction the monastery at Tatev is among the exceptional creations of Armenian architecture which for centuries has been a vibrant centre of Armenian spiritual life, science and culture," he said. The reversible cable car line cost $US18 million ($A18.17 million) with much of the funding coming from private donations, according to the National Competitiveness Foundation of Armenia, which oversaw the project. It runs from the village of Halidzor near a highway connecting the Armenian capital Yerevan to the village of Tatev, within walking distance of the monastery. The cable car travels at a speed of 37 kilometres per hour and a one-way journey takes 11 minutes. At its highest point over the gorge, the car travels 320 metres above ground level. An impoverished ex-Soviet republic bordering Turkey, Iran, Azerbaijan and Georgia, Armenia is keen to develop its tourism industry, showcasing its history as the first country to have adopted Christianity. Residents said they hoped the new link would help restore the economy of the local area, which like much of rural Armenia has suffered from deep poverty and an exodus of young people looking elsewhere for work. "I hope the opening of this cable car will help revive tourism so that there are new hotels and new jobs and so that the young people who have been leaving for Russia or other countries will instead stay home and work here," said Armais Minosian, an 80-year-old local villager. The cable car is part of a $US50-million public-private effort to develop tourism at Tatev and in the surrounding region, one of the traditional 15 provinces of the ancient Kingdom of Armenia. The project has also seen the government renovate 26 kilometres of the highway from Yerevan to Tatev and the restoration of parts of the monastery complex. The Sandia Peak cable car in the US state of New Mexico, which runs 4.3 kilometres, had previously billed itself as the world's longest cable car line.